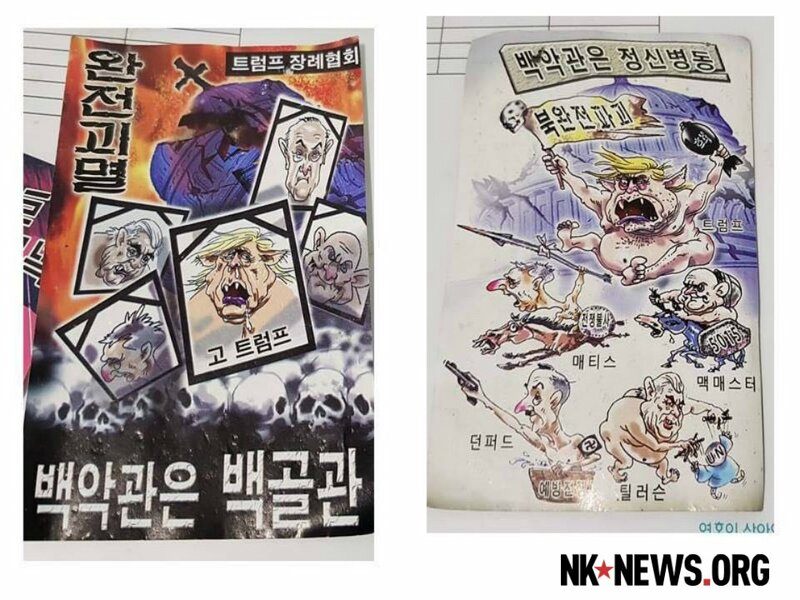 Graphic cartoon says President's death will create "a peaceful and war-free world"
More pro-North Korean leaflets, potentially sent by the DPRK via balloon, were found in South Korea’s capital on Sunday and Monday, describing U.S. President Donald Trump as a “crazy dog” and calling for his dismemberment. 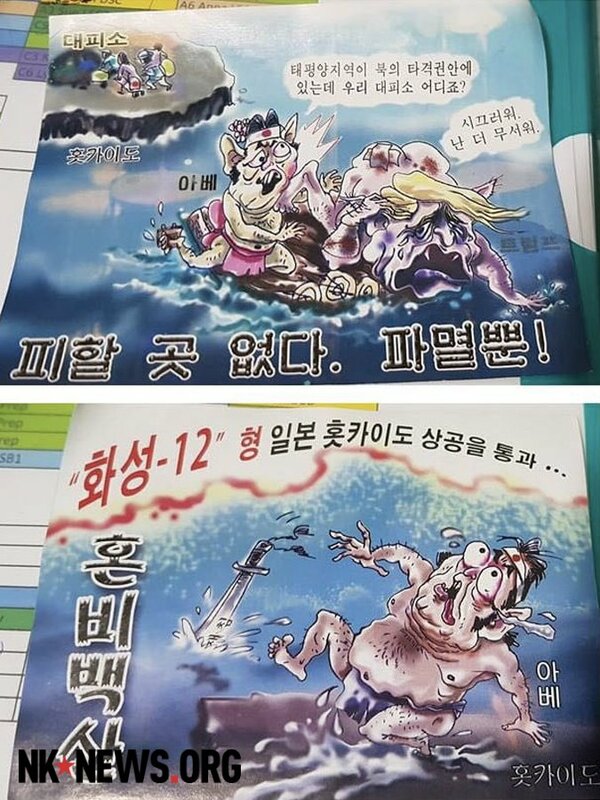 The cartoons come amid a flurry of pro-North leaflets appearing in Seoul in recent weeks. 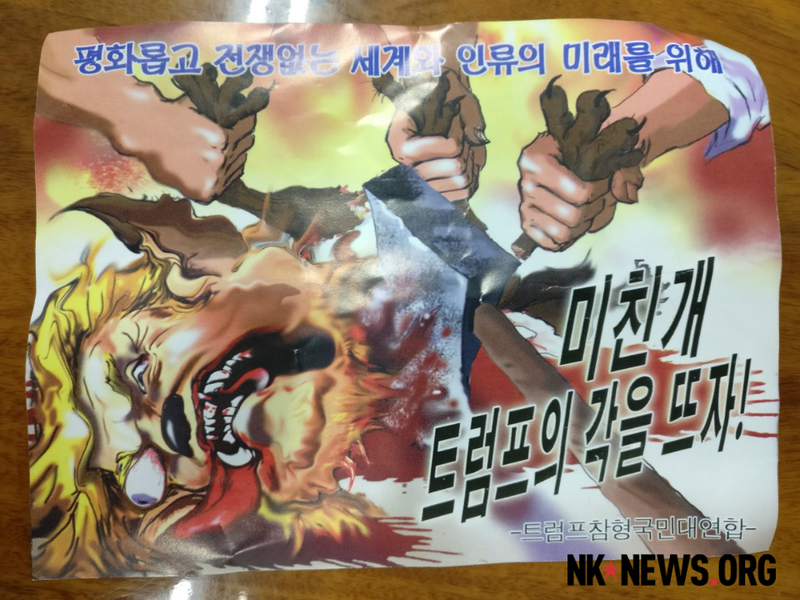 Found on Mount Bukhan in northern Seoul on Monday, one leaflet calls the President “crazy” and depicts him as a dog with a missile in his mouth, featuring the phrase “total destruction of North Korea” – echoing a speech by Trump at the UN in September. “I will annihilate all 25 million North Koreans,” Trump says, while two onlookers, who appear to be South Korean officials, criticize him. “[Trump] must have gone completely crazy,” one says. “A war will happen if [we] let him do,” another adds. The other side of the leaflet depicts Trump being decapitated with a hatchet and his hands and legs being dismembered. “For a peaceful and war-free world and the future of mankind, let’s cut up Trump – who is a crazy dog – in several parts,” the leaflet reads, with the words “grand national union of beheading Trump” at the bottom. 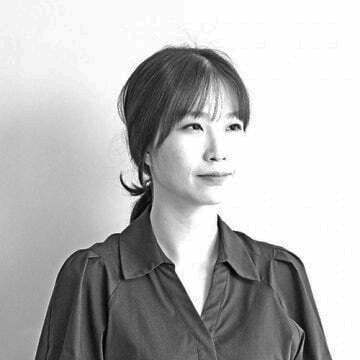 More were spotted in Sanggye, in the northwest corner of Seoul on Sunday, attacking key figures in the Trump administration. One leaflet shows portraits of “the late Trump,” with the words “complete destruction” and “association for Trump’s funeral” displayed below. James Mattis is also seen riding a horse and brandishing a spear and a shield with the words “willing to go to war,” while Tillerson manipulates a puppet representing the UN. Another leaflet found on Sunday mocks Japanese Prime Minister Shinzo Abe, and shows off Pyongyang’s recently developed missile capabilities. “Where is our shelter – the Pacific area is within striking range of North Korea?” Abe tells Trump as they squabble on a raft. “[You’re] noisy. I am more scared,” Trump replies. Behind the two leaders, residents of the Japanese region of Hokkaido, the site of a North Korean missile flyover in September, head to a shelter. “There is no place to avoid. [There is] only destruction,” the phrase placed at the bottom of the leaflet reads. The other side depicts Abe slipping and dropping a sword with the word “reinvasion” into the sea. “Hwasong-12 crossed the sky above Hokkaido of Japan” and “frightened out of wits,” it reads. 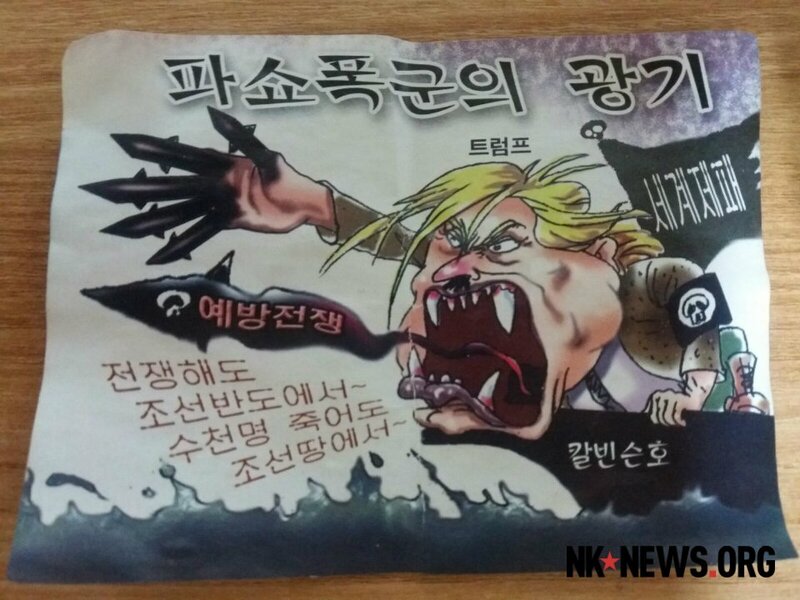 One leaflet found near Yonsei University on Monday says Trump has the “lunacy of a fascist tyrant,” and depicts him as Adolf Hitler. 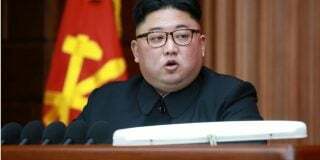 “A preventive war, even if a war happens, it will happen on the Korean peninsula, and if thousands die, [they] will die on the Korean peninsula,” Trump yells on board of the nuclear-powered USS Carl Vinson aircraft carrier – a reference to comments made by Senator Lindsay Graham in August. 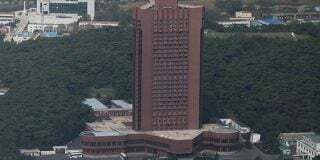 Meanwhile, the South Korean presidential office confirmed to NK News that pro-North Korean leaflets had been found near the Blue House on Monday. 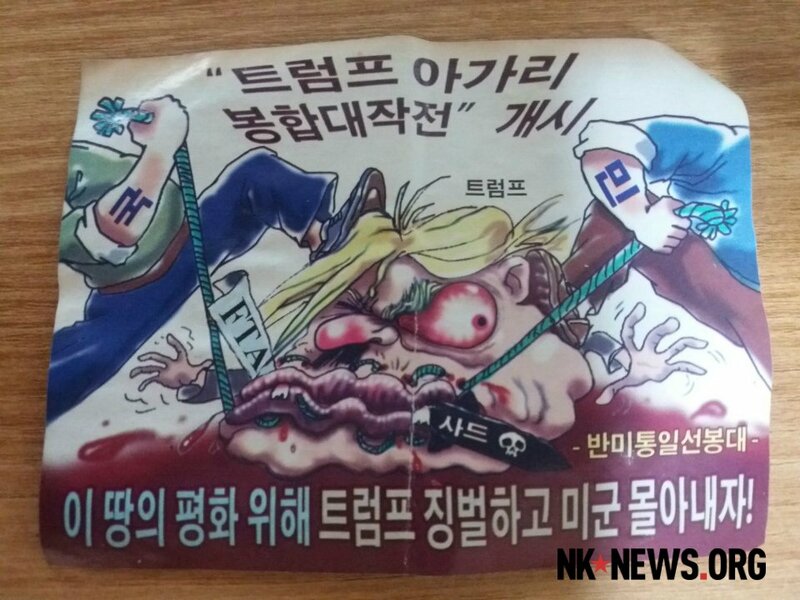 The leaflets are among several anti-U.S., and particularly anti-Trump, leaflets spotted in Seoul in recent weeks. 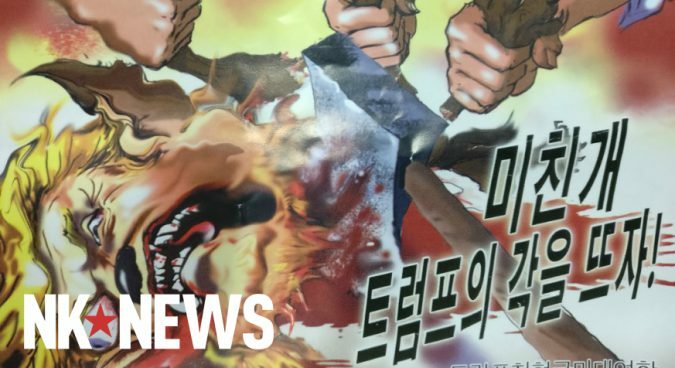 Over the weekend, a graphic propaganda leaflet found by NK News in central Seoul depicted Trump’s head being trampled by a North Korean soldier’s boot. 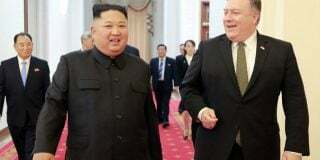 Leaflets found earlier in the month attacked the Trump administration’s policy towards the DPRK, and showed off Pyongyang’s military capabilities. 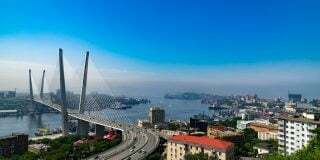 The balloons may been sent from the North Korean side of the border and burst at high altitude over Seoul, with the cargoes of leaflets subsequently falling across wide areas of the city. Subscribe to read the remaining 829 words of this article.